Long time Sierra Madre resident, business owner and philanthropist William “Bill” Sullivan, Sr., passed away on Wednesday, Sept. 21, 2011 at the age of 82. Born in Chicago on July 7, 1929, Bill served in the Army during the Korean War. He moved, along with his wife and three children then aged 7, 6 and 4, to Sierra Madre in 1963 and opened The Bottle Shop liquor store, which he owned until 1984 when he sold it, though it remains in the family. Following that, Bill and his wife Marie constructed and own Sierra Madre Self Storage on Montecito Ave. In addition to running his businesses, Bill was active in the local business community and service organizations, serving on the Board of Directors of the Sierra Madre Chamber of Commerce and the Sierra Madre Community Hospital. He also served on the Bank of America Achievement Award Board and was a recipient of the “Recognition of Service” award from the American National Red Cross. He was a past president of the Kiwanis Club of Sierra Madre and Sierra Madre Little League. One of Bill’s lasting legacies is the Sierra Madre City College, a philanthropic organization which each year is one of the first entries in the Sierra Madre’s Fourth of July parade, represented by a marching band and a float which is one of the most anticipated entries in the parade, because most years it is an irreverent look back at something that is or has been a subject of topical discussion in the community. Bill and the late Hugh Warden were two of the driving forces behind the City College, and for the last several years, Bill has driven or been driven in the SMCC’s “president’s” vehicle in the parade. Each year the SMCC raises money to put back into the community. Over the years, the City College has donated to the City’s ambulance fund, and to Sierra Madre Search and Rescue. They donated a flagpole to St. Rita’s School, and installed a concrete art patio for the Kindergarten students at Sierra Madre School. They’ve installed lighting at Sierra Vista and Mountain Trail parks, funded a patio on the east side of City Hall and the south side of the Senior Center. With Kiwanis, they helped fund the pergola area in Memorial Park, and they are also responsible for the covered barbecue area in Sierra Vista Park (a revenue generator for the City). They’ve also installed barbecue sets in Memorial and Sierra Vista Parks. Bill also took pride in being cantankerous and in his efforts to keep City Hall honest. 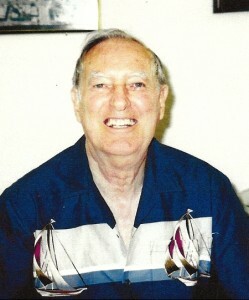 Mr. Sullivan is survived by his wife of fifty-six years, Marie, and three children, his daughter Kathy (Paul) Copeland, and two sons, Bill, Jr. (Patty) and Dan Sullivan. He also leaves behind six grandchildren, Melissa, Michael, Jay, Jeff, Tracy and Sarah. His brother Frank Sullivan and his sister, Betty Davis, predeceased him. A memorial service will be held at St. Rita Catholic Church, 318 N. Baldwin Ave. in Sierra Madre, on Tuesday, Sept. 27, 2011 at 10am, followed immediately by a reception at O’Malley Hall, also at St. Rita.